What place is this? I look north as an eagle flies to the backbones of the Appalachian Mountains where rain clouds fill spruce forests. Gentle mist rains down separating grains of quartz from granite faces. Sweeping down the slopes into valleys, I fast forward to witness waters move mountains to the sea. Sparkling crystals settle out onto the floor of a tranquil ocean piling up into the barrier islands of the Gulf of Mexico where I now live. I look east across canopies of live oaks draped with Spanish moss to stands of tall straight pines that go as far as I can see. Swooping closer, clear springs well upward into the sun. Their round blue eyes dot the land and lead to cavernous passages underground that undulate across the whole continental shelf, a sponge that holds the rain–Florida’s fresh water supply. I see manatees and myriad elegant white birds, and alligators—immobile denizens sunning on cypress logs and mossy banks. The dark Atlantic forms a border. South of this place there lies a small aquamarine ocean and a current where schools of fish ply the depths and dolphins play and hunt them. Sailboats, ocean liners, fishing vessels, and ships cross this Gulf of Mexico, bounded by the Florida Straits, Cuba, and the Yucatan Peninsula to the south. The Tropic of Cancer runs through it. The ocean current pours trough the Yucatan Peninsula and Cuba forming the Loop Current and exits through the Straits of Florida becoming the warm Gulf Stream current in the Atlantic Ocean. The Gulf produces food for our nation and the world: billions of pounds of fish and crustaceans are harvested each year. 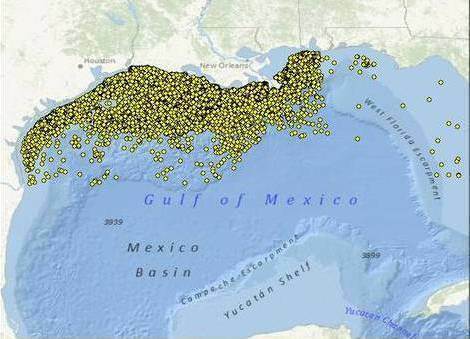 Along the shores of States that have allowed offshore drilling there are nearly 4,000 oil wells. Deep Water Horizon was just one of them activated to produce crude oil for the American economy. This map below may shock you as I was during the DWH tragedy when my community, and indeed the nation, fully realized how much industry impact had taken place under our noses (under the surface of the Gulf) for the short-term gains of oil lease money. This is a place of warmth, sunlight, rampant vegetation (semi-tropical), Old South mixed with military and snow birds from around the nation. It is a place without true unity, a place still in search of its identity. Historically Pensacola has flown five flags (Spain, England, France, Confederacy, and United States). The deep water bay draws enduring interest for its strategic advantages. All that existed here prior to European invasion and occupation was little known or even appreciated, yet a native culture long evolved here by the sea. Migrations of sea turtles and birds from around the world have known its location and character for millennia before Europeans showed up. They still come but in fewer numbers. The place has been shaped by invaders from lands where they had already exploited the natural resources. The Europeans hungered for new land. But the land was not friendly to them, at least in the beginning. What became known as Florida was inhospitable for many centuries. It geologic, meteorological, and wild landscapes defied occupation. The original human communities who lived in its recesses had learned its strange creatures, wild weather, and poor soil. They adopted a migratory pattern coming to the ocean near Pensacola for fishing and clamming, then retreating into the cooler forested canopies for the hotter months. Their wisdom and art was never sought nor recorded only disrupted and eventually shut out. That is another part of the story of this place. Slavery is part of it, too, with African and West Indies men and women brought here to help with timber cutting and hauling, fishing, and cotton growing on farms north of the city. As late as 1900 fully half of the city was black and not because the community was egalitarian. Whites ran the show. Blacks were capital, owned and/or exploited. Even to the present, many white residents have a different standard of conduct with and regard for their black neighbors, but they would vociferously deny that. The truth is that Florida harbors some of the worst racists in the nation. Another important point on the compass for Pensacola, Florida is the community of people who love the ocean and environment for its recreational and economic value. Some love it also for its esthetic value and fewer but stronger are handfuls of residents who defend the animals, plants, and waters of our place with their very souls and livelihoods. This then is the place where I live and from which my story continues.